Rosario Dawson read “Artemis” to me on my car ride to and from Virginia last week. It was delightful. Okay, Rosario wasn’t in the car with me. But her voice was–she is the audiobook reader for Andy Weir’s new book, Artemis. If that name rings a bell, it’s because he wrote the excellent book “The Martian,” which was a huge hit and went on to become a great movie. The Martian worked so well (in my opinion) because Weir used science to make the impossible possible. Artemis does the same, but on the moon instead of Mars. The book is set in the somewhat near future where there is a city on the moon called Artemis. Learning about how the city works is one of my favorite aspects of Artemis–it’s amazing how much thought Weir put into every aspect of the city. 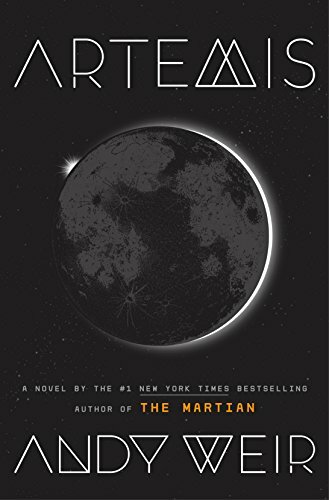 While The Martian is a tale of survival, Artemis is a heist/mystery. And it’s so good. The plot kept me wanting to know what happened next, and it was complemented by the characters, worldbuilding, and humor. There were several lines that made me laugh out loud. Oh, and Rosario Dawson did a great job with the audiobook. It would be pretty awesome if she is also cast in the inevitable movie. I highly recommend Artemis, and I look forward to hearing your thoughts about it. This entry was posted on Tuesday, November 28th, 2017 at 10:06 pm	and is filed under books and tagged with books. You can follow any responses to this entry through the RSS 2.0 feed. I stayed up all night on release day so that I could read it. And it was awesome! I love that you recommend a book in which science makes the impossible possible. Chalk one up for great science edutainment as the royal road to public science literacy, the mission closest to my heart! I’ve been tearing through a lot of audiobooks lately in an attempt to make my long commute more enjoyable, and I have to say that it’s been life changing! I’ve had my eye on Artemis since it came out a couple of weeks ago, and this will definitely ensure I add it to my library as soon as I listen to a few other books I’ve already downloaded. I loved The Martian, but felt like it did get a little dragged down with all of the mathematic calculations at times. I was able to skim through those sections when I felt like it, because I actually read that one on my Kindle, but it would be more difficult to do that with an audiobook – is Artemis the same in that regard? That’s a great question. I think Artemis balances it a little better, as nothing is too technical. There’s a lot of science, but Weir usually keeps it to 1-2 sentences at most, so it doesn’t interrupt the flow of the story in Artemis. It’s on my list of things to read, which also includes Terminal Alliance by Jim C Hines, who’s previous LIbromancer books I enjoyed. I’ve been reading “The Phoenix project” which is a little bit about how project management can learn from Factory work, and setting up things like the Kanban boards to help groups get tasks done. We use the Kanban a lot in my job, staging things that Need done, are being worked on, in another stage. Seeing where blockers are, and how to schedule a project so it gets done on time. Its in a narrative form, and an easy read, and mention it here as I know you usually have a few projects with a few team members and might benefit from it as well. Thanks Sean! That sounds like a great business book.